At only 1 year of age, Baby Grouch has taught me how (approximately) 8230753 lbs of mommy-love can be squeezed into a teensy, tiny, Grinch-sized heart. She’s also taught me that the equivalent poundage of terror can be packed into that same cubic volume. Like some anxiety-riddled, futuristic camera, my brain captures images of Baby Grouch in worst-case scenarios. It would be easy to get sucked in and dwell on this imaginary album and give myself multiple heart attacks each day. I have to refocus my mental camera constantly, to appreciate the real view in front of me. It isn’t always easy. Sometimes the refocusing of the Crazy-Brain Camera feels less like rotating the lens of an SLR and more like trying to swivel the steering wheel of a semi truck that lacks power steering. With that in mind, here’s my letter to Baby Grouch about my anxieties and my corresponding, seemingly rare, moments of clarity and sanity. When you are asleep, she checks on you once before she herself tucks in. Sometimes twice. Even though she knows you are probably okay, sometimes the silence scares her. She is reassured by the rising and falling of your chest. She marvels at the fascinating science of DNA inheritance, as she observes you fast asleep with one leg bent at the knee, up in the air, crossed over the other, just like your father sleeps. She admits, without remorse, that she has, on occassion, slightly disturbed your slumber in order to hear you emit an audible sigh. While you are at daycare, she knows you are in good hands, but she has moments of panic that a tragic mishap will take place. A slip. A fall. An accident. She might even work herself up into an unwarranted frenzy at the prospect of a trivial busted lip. When she walks in to pick you up, and sees your happy, healthy self at play (with both lips intact) a breath she didn’t realize was wedged in her chest escapes out of her mouth. She is so relieved that she doesn’t even mind the smashed graham cracker in your hair or the dried snot under your nose smearing all over her shirt as she gives you a grateful embrace hello. Every time she hears a news story of a shooting, a car accident, a drowning – she thinks to herself that losing you in such a fashion would be unbearable, unimaginable, fall-on-your-knees-with-your-mouth-hanging-open horrifying. Every time she hears a harrowing story when she’s in the car, at work, watching television or out with friends, for a split second she replaces your wide eyed, grinning, gap-toothed face with the victim’s. She morbidly imagines the photograph that would accompany your news story, one of you scrunching up your nose in excitement, or one of you smiling, with your eyes open wide – two almost-perfect orbs, the left slightly narrower than the right – showing off your favorite doll to the camera. During this brief gruesome flash, she holds back the tears that threaten to pour off her lashes. She manages to keep herself together as she almost falls apart at the mere reminder that bad things happen to good people all of the time. Depending on where she is, this can sometimes be embarassing. But it can not be helped. When she’s at work, as a high school teacher, hearing snide remarks and bullying tones and hurtful words coming from the mouths of some of the kids, she pictures you as a teen, getting crushed by broken friendships, broken promises and broken hearts. It pains her even now to think of your inevitable heartache in the future. She knows that even though some people make it through high school unscathed, no one makes it through life without some significant rough patches. But your Mama doesn’t always worry. While you play you are cheery and you are able to amuse yourself, yet you love to share your joy and engage with those around you. You bang toys together, on the table, on your head. You laugh. You give them to me, then take them back, then give them to me again. You hug your baby and kiss your Elmo. You make “fish” face and surprised “oh!” face and your sideways head tilt “cute” face for the purpose of amusing those around you. You stack your blocks, and joyfully knock them over with a Boom! If you fall while you’re exploring, you get back up. You are strong. You babble as you page through your books and point at the images you look at. You are smart. Oh so smart! And also silly. A winning combination for life. While at daycare you grow and learn and improve your skills. She’s watched you perform independent tasks since you were only months old and continues to hear reports of how you excel. And she’s proud. She also hears periodic reports of your strong-willed nature, your refusal to follow an occasional rule when you don’t want to, or to want to sometimes do things on your own terms. No one can make you crawl up the steps or eat a cheese quesadilla or sleep for longer than 45 minutes at a stretch, if you don’t want to. And for this, she is also proud. Mama would worry if her daughter didn’t sometimes question what she was told to do. When you’re older she knows that while you’ll mature and learn new things, you’ll essentially be the same person that you are now. People may go through different phases and stages, but they really don’t change all that much, in the long run. You’ll be strong. You’ll be smart. You’ll be silly. And Mama will still be proud. 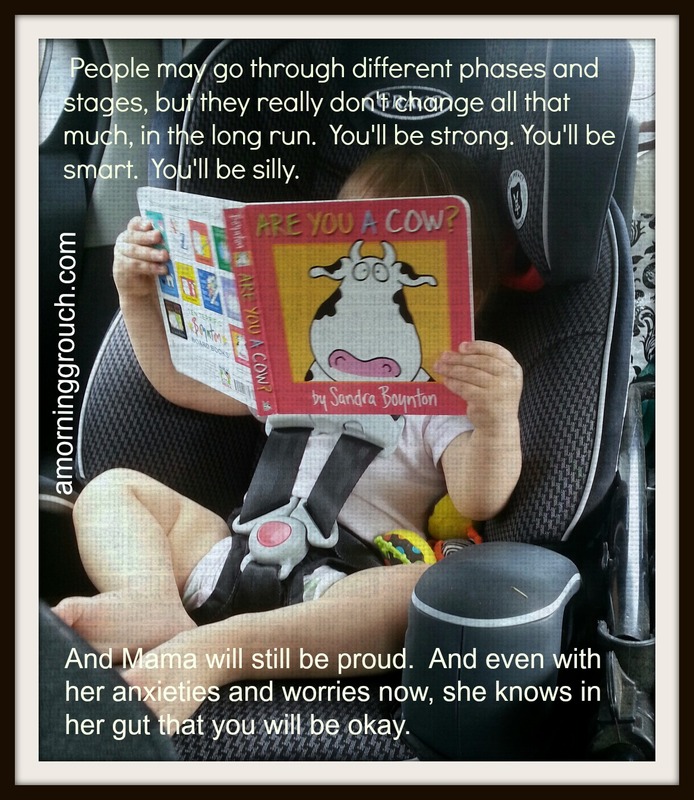 And even with her anxieties and worries now, she knows in her gut that you will be okay. Mama worries, but knows that you will be okay. Yea, sometimes you just need to stop the anxieties and crazy thoughts by making sure everything is okay! And yea, I imagine that the worries just grow as fast as the kids! We might just share a brain. Also? I missed you! Are you okay?? Missed you lots. Lovely awesome post. SO glad you’re now. Missed you. Yea, I sometimes disappear for a bit, and then when I emerge I go through my stacks of blogs in my inbox and binge read. It just goes along with my mini-manic episodes and mini-depressive ones. Super yay on the lego tray in your bedroom, even if it WAS before the crack of dawn! It’s the little things that can be the big things, right? And OH MY GOD what is up with all the damn sink holes?! Terrifying. 🙂 that IS the best part. so much beauty. Not to scare you, but the worrying part never stops. My girls are all grown and on their own, but I still get that little knot in my stomach every time my phone rings unexpectedly. PS: Glad I saw you on Freshly Pressed (I am seriously envious) – I’ve perused (was afraid to use the word “read”, ha ha) your blog, I’ve become one of your followers. I can already tell that the worrying never stops! In fact, I know she’s the safest she will probably ever be right now. Mothering is so good for, and also so stressful on our hearts!! Thanks for “perusing” haha – I’ll check you out too. My oldest of four is 10, my youngest 5 months, and I still nudge the baby to hear her sigh and panic if my oldest is just a little bit late coming home. What a beautiful and terrifying ride parenting is. I am so relieved to know that I’m not the only person that has to hold back tears when that instantaneous horrific thought comes into my head after hearing a tragedy. I’m glad I’m not just some strange, morbid woman that cannot beat those thoughts back, knowing that I’d be an empty shell of a woman should something ever happen to my babies. And I especially love that you called your little one “baby grouch” 🙂 Thanks for blogging!